A carte-de-visite portrait of Captain Hugh de Grey Seymour (1843-1912), from 1884 the 6th Marquess of Hertford. 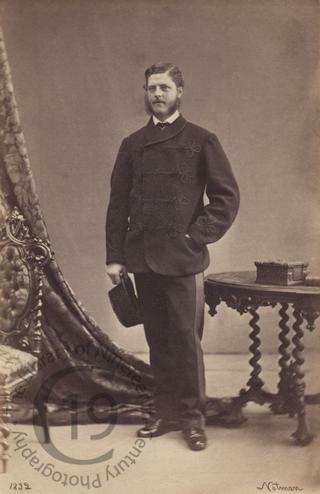 Born in Dublin on 22 October 1843, he was the eldest son of Francis Seymour, 5th Marquess of Hertford. He served in the Grenadier Guards, achieving the rank of captain. He became known by the courtesy title Earl of Yarmouth when his father succeeded to the marquessate of Hertford in 1870. In 1869 he was elected one of the MPs for Antrim. From 1874 to 1880 he was the MP for South Warwickshire. When his father succeeded to the marquessate of Hertford in 1870, he became known by the courtesy title Earl of Yarmouth. In 1884 he succeeded to the marquessate and entered the House of Lords. He served as an aide-de-camp to Edward VII between 1902 and 1910 and to George V between 1910 and 1912. In 1905 Lord Hertford was appointed Lord-Lieutenant of Warwickshire, a position he held until his death. In 1906 he was appointed a Companion of the Order of the Bath. On 16 April 11868 he married the Honourable Mary Hood, daughter of Alexander Hood, 1st Viscount Bridport. The marriage produced eight children. Lady Hertford died in April 1909, aged 62, while on a voyage to Palestine. Lord Hertford died at Ragley Hall, Warwickshire, on 23 March 1912, aged 68. He was succeeded in the marquessate by his eldest son, George. Photographed by William Notman of Canada. Signed by the sitter on the album page and dated 22 December 1862.